When you receive an invitation in Outlook in Office 2011 for Mac, you open it the same way that you open any other e-mail message. Double-click an invitation to open it in its own window. Good manners suggest that you respond to invitations promptly. You can respond with the click of a button to accept, tentatively accept, or decline invitations. When you accept or tentatively accept an invitation, it’s added to your calendar. Declining does not add the event to your calendar. Respond with Comments: Opens a new window where you can include a message along with your decision notification. Respond without Comments: Lets the inviting party know your choice without further ado. Do Not Send a Response: If you accept or tentatively accept, this option adds the event to your calendar but does not let the inviting party know you accepted their invitation. 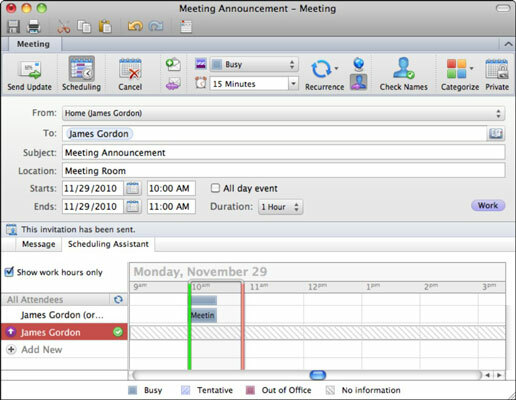 Outlook can process calendar requests from any standards-based calendar application, including Microsoft Entourage, Microsoft Exchange, open-source Sunbird, Oracle, and Google Calendar. When the event organizer receives an acceptance or rejection notice, Outlook places a notification in the Scheduling Assistant of the invitee’s response. The Scheduling Assistant displays a list of the attendees and their responses. The Scheduling Assistant has some extra control, so if you’re the event organizer, you can use this control in case someone changes their mind and tells you without using an Accept or Reject Calendar message. People often accept an invitation over the phone, or even in the office corridor! You need to input that acceptance into Outlook. Just click the response indicator from an attendee (even if they haven’t yet responded), and manually change the response. The response indicators are actually buttons, even though they may not look like buttons.